I’ve got another fabulous Super Bowl Recipe to share for the big game on Sunday, and this one is sure to be a crowd pleaser. If you liked my Weight Watchers Buffalo Chicken Strips Recipe, you’ll love this Weight Watchers Buffalo Wings Recipe!! This delicious and easy to make Chicken Wings Recipe has a fabulous Blue Cheese Dip and a tangy buffalo sauce that is to die for. 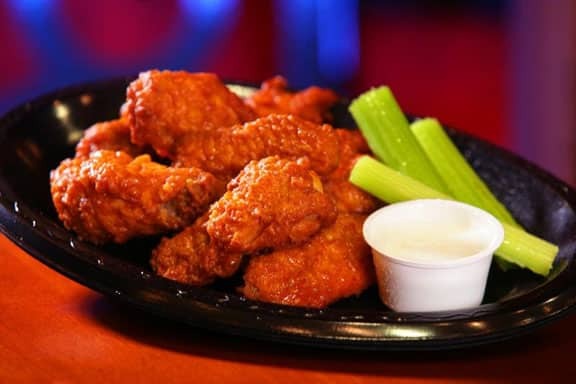 A good buffalo wings recipe is pretty much an essential for any good Super Bowl Party food, but if you are a Weight Watcher, traditional buffalo wing recipes can really rack up those Weight Watchers Points. But with this low Point wing recipe, you can really enjoy yourself! And as an added bonus, you are getting a fantastic Weight Watchers Blue Cheese Dip Recipe too! Plus, it’s SO yummy, all of the non-Weight Watchers will love it too! Preheat oven to 400ºF. Coat a large baking sheet with cooking spray. Dip wings in Frank’s Red Hot Sauce. Then, place chicken wings in a zip-close plastic bag, add taco seasoning, seal bag and shake to coat. Transfer wings to prepared baking sheet and bake until cooked through, about 18 to 20 minutes. Meanwhile, to prepare dip, whisk together sour cream, cheese and milk. Serve wings with dip and celery on the side. Recipe makes 4 servings. I have tried 4 times to read this recipe on my Ipad. I cannot see the recipe because of all you pop ups and ads. I love yiur recipes, but right now I’m very frustrated! What is your technique for skinning the wings? I need instructions. How are “chicken wings” defined? Is it 12 complete wings or 12 segments? Could you make these as boneless wings by cutting up small chunks of chicken and then preparing them following the recipe? Hi – I found you from the Zip List top recipes. Love this one. But I’ve never seen skinless chicken wings. Drop by my kitchen for a visit. Like you on FB. I have found the skinless chicken wings only TWICE. Ugh. Once I was able to convince the butcher to skin them for me, and a few other time, if I’ve been really desperate for skinless wings, I’ve done it myself. Painstaking. But yummy! Can I leave off the taco seasoning. I don’t know if taco seasoning and wings mix very well? Thanks!! I can see from the picture that THOSE wings have the skin on. Do you have a photo credit, because they do look great – or do you have a photo of the wings you made? This recipe looks great. Can you tell me what the updated points plus total is? Great news…it's still 3 Points Plus!! I just updated the post with nutritional stats and the new Points + Value. I hope these will be smothering your Super Bowl Party Food table this year!! This recipe looks great! Can you tell me what the new points plus value is? I still don't understand how this is only three points! Please explain. Using the skinless chicken wings is what saves you all the extra calories. It really makes a big difference. Also, wings are pretty small…so you aren't really getting much sauce on them. And the dip really isn't many calories either, thus it helps to keep the Points value low. My husband loves the wings without the dressing. Can you tell me the points for the wings only without the dressing? Thanks! Great site. So glad your husband likes the wings!! My husband is a fan as well. And I let him eat it a few times before I told him it was a Weight Watchers Recipe :). To answer your question, the dressing is pretty low calorie and only adds about a half a Point. So, to be on the conservative side, I would say, just don't adjust the Points value at all. That way, if you go over your Points a bit somewhere else during the day, this will kinda give you some insurance. But if you do track half Points, then a serving size would be 2.5 Weight Watchers Points. Thanks for reading!! where can I buy skinless chicken wings? They can be pretty hard to find….so I usually just remove the skin myself. It's tedious, but removing the skin can really save you some Weight Watchers Points. If you have a Trader Joe's in your neighborhood, check there first. If not try a local butcher.